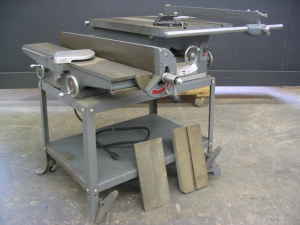 This Delta Table Saw Jointer Combination machine included a 6" jointer and a 10" tilting arbor table saw mounted on a single stand with one motor. The Delta 6" Jointer was model number 37-220 and the table saw was no. 34-425. The motor was a Delta 1 1/2 HP single phase and powered both machines. It also inclued the retractable casters at the base of the stand for easy moving around the shop. I think this machine was from the late 1950's or early 1960's. The saw's Serial Number is BX-2726 and the jointer's Serial Number is 6Y7033. The bearing is holding on the arbor, however it would be good to replace it. Feel free to provide any info on manual's, parts, blade guard etc. as it is a very, very functional tool and I aim to keep that way, that is running. It is from the late 1950's. I have one and I was thinking of selling it but I have no idea what it is worth.It is in good condition.